I while ago we shared some pictures of a work in progress Pam and Deboni were collaborating on. After a year of work, the home is finally completed and we wanted to share some photos of the first completed room. 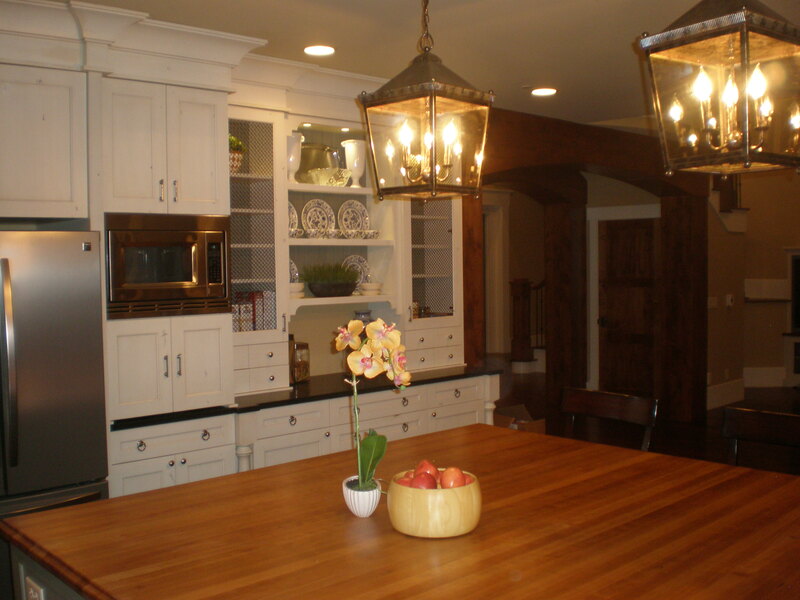 We were planning on using a photo of the kitchen for an ad in home design book but because our client wasn’t in a hurry to furnish and accessorize the home (he wanted to take his time and find unique pieces that he really loves) the kitchen was far from photo ready. We received word that the design book was going to the printer this week so we decided to stage an impromptu photo shoot. We loaded up our cars with pretty things to make the kitchen feel more lived in and took over the kitchen for a couple of hours. Although, there are some additions or changes I would make if we were purchasing items specifically for the kitchen, I think the pictures came out pretty good. Because the photo shoot was last minute, we weren’t able to hire a professional photographer so I did my best I could with my little snap shot camera. Here are a few of the hundreds of photos I took in hopes that there would be one usable photo. Enjoy! A view of the entire kitchen from the great room. The winning photo. We will post the finished ad soon. The runner up. 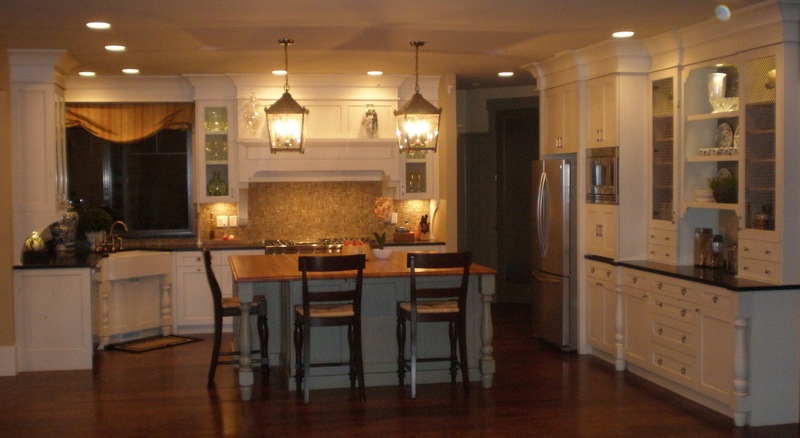 We were torn about which photo to use because we really loved the brightness of the detail shot but ended up selecting the shot that showed more of the kitchen. Hood detail. 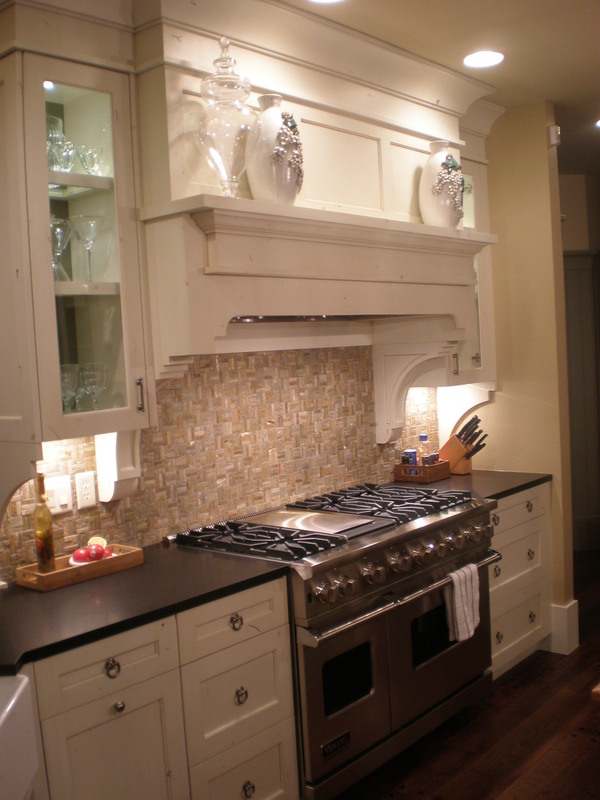 I love the rough texture of the backsplash against the more elegant painted finish of the cabinets. 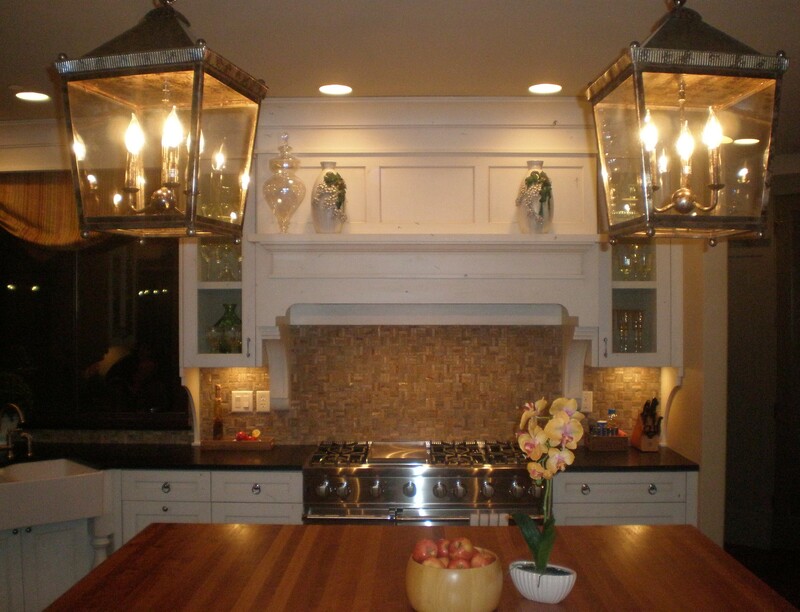 A pair of lanterns bring some charm into the space. 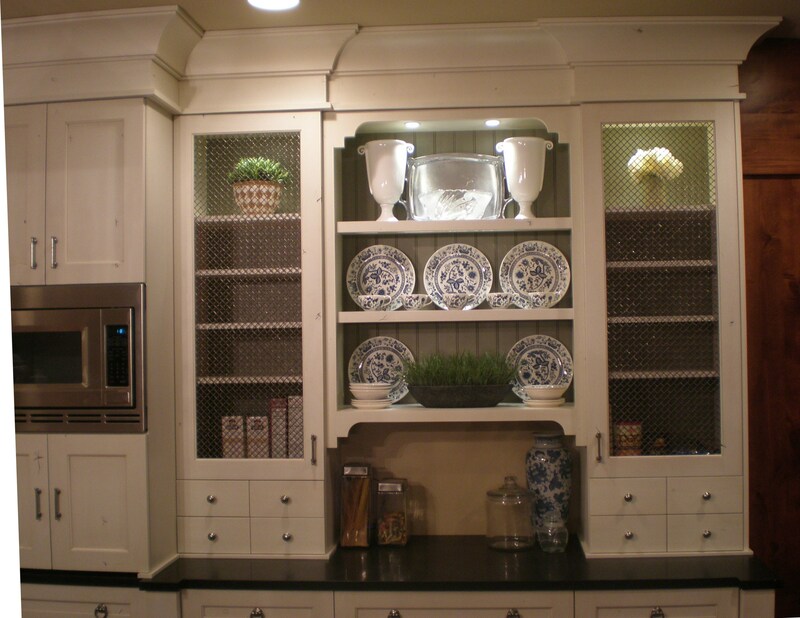 You can’t quite tell in the photo, but the cabinets next to the open shelves in the hutch have a metal mesh panel instead of a solid wood door. 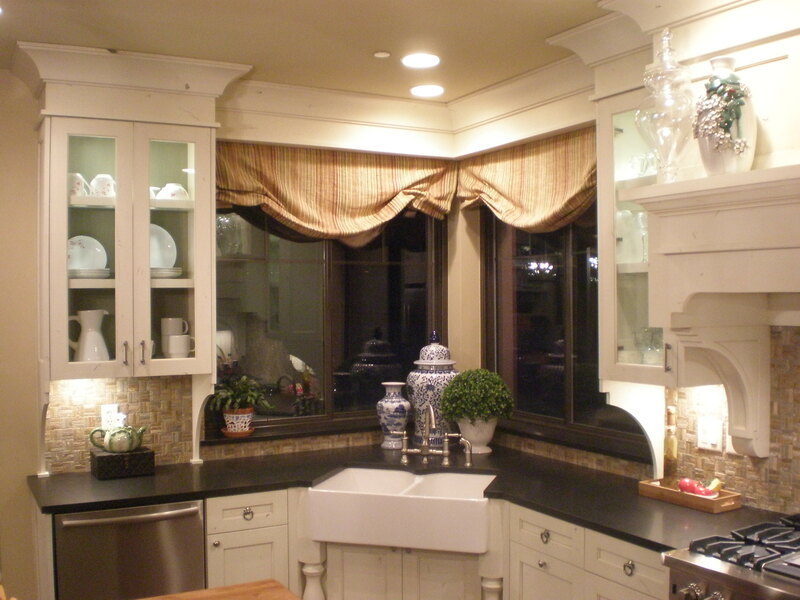 Mesh is a great way to break up the space so the cabinets don’t feel too heavy. If you need more closed storage, gathered sheer fabric behind the mesh would be a great addition. 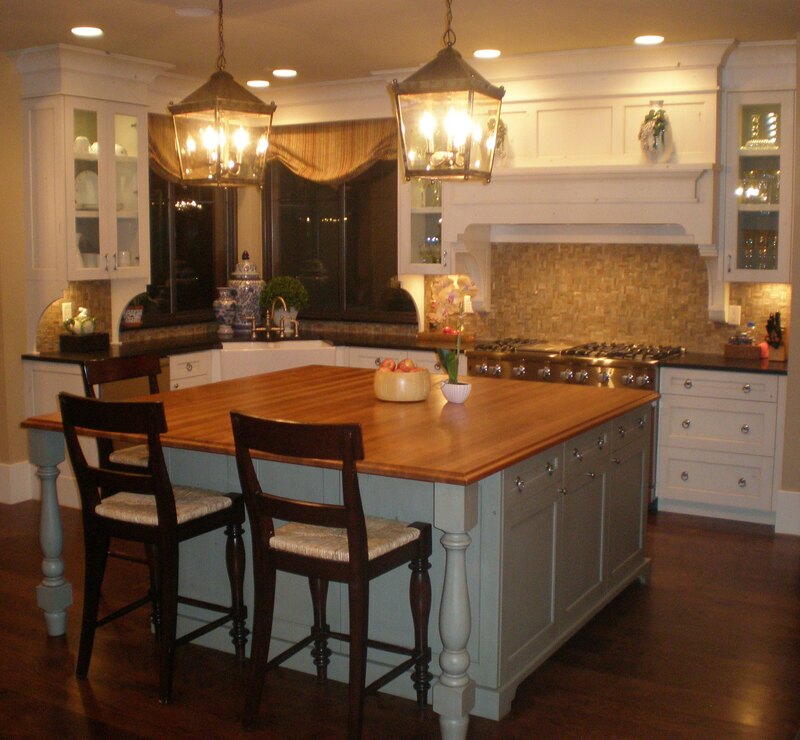 I love the warmth the oiled cherry butcher block brings into the space. It ties in nicely with the stained archway leading to the entrance of the home. This was a great project that we’ve really enjoyed working on. We can’t wait to share some of the other finished spaces with you soon. This entry was posted in Accessories, Interior Design, Kitchen Design, Portfolio. Bookmark the permalink.